All new bubble gum flavor is here! 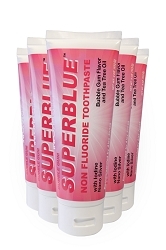 Superblue is a revolutionary new toothpaste blend with Iodine and Nano Silver designed to deliver a powerful clean while supporting good oral health and fresh breath. 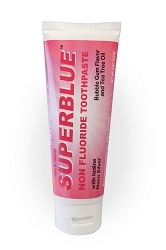 Introducing Superblue Fluoride-Free Toothpaste by Infowars Life™, the groundbreaking toothpaste that features natural oils and ingredients used since Aboriginal and Biblical times to supercharge good oral health and fresh breath. 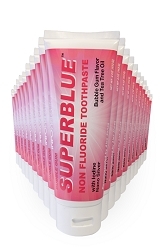 Instead of containing fluoride, Super Blue Fluoride-Free Toothpaste™ is loaded with 'the good halogen' iodine and an array of other beneficial compounds that have been hand-selected for their oral health benefits. Xylitol – Championed by many oral health experts worldwide, xylitol may help support the natural health and normal remineralization of teeth. 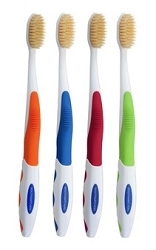 Low levels of xylitol are found naturally in the fibers of some fruits and vegetables like berries and mushrooms. 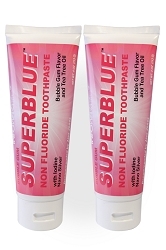 Iodine – In addition to its role as an essential mineral that supports thyroid health and well-being, iodine was specifically chosen by our team of dental experts as one of the primary ingredients in Super Blue Fluoride-Free Toothpaste™ for its many benefits in supporting good oral health.